After Spain, the next European country I had my eye on was Germany. I had dreams of biergartens, pretzels as big as my face and friendly locals. Last fall, that all came true, and then some, including moments of learning and self reflection about our world’s past and my first view of the Alps – stoic, icy mountains warmed by September’s fall foliage. I got some stormy and dreamy photographs that I wasn’t expecting – see below! We traveled in planes, trains and automobiles from Munich to Berlin and back through charming Bavaria. For once, I wasn’t involved much in the planning and went along for the ride. 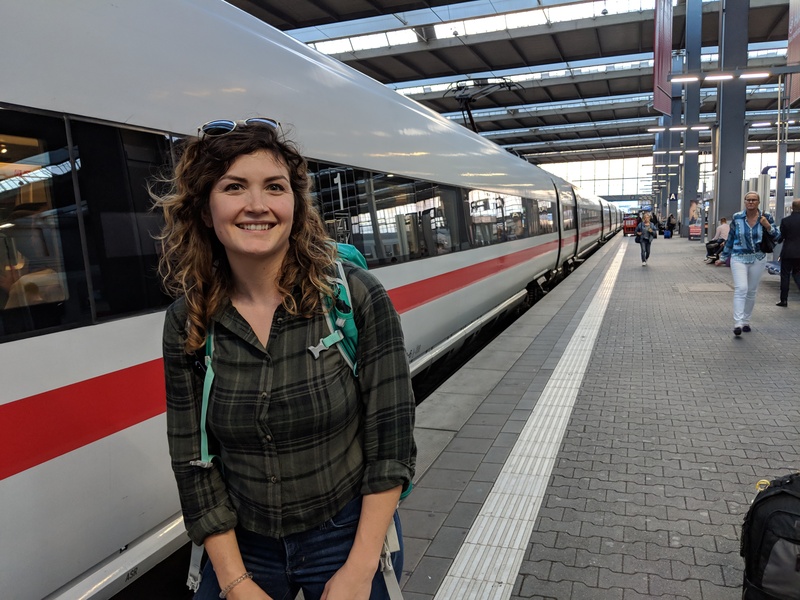 I’ll briefly list our stops and share some photos in hopes of inspiring your adventure to Deutschland. We purposely planned our trip around Oktoberfest (usually the last two weeks of September). If you’re into German beer and don’t mind a crowd – I highly recommend this experience. We came on a Thursday and started early so we a chance to walk through all the tents and sit down in a few to enjoy steins of beer. By 4-5 p.m. the tents were filled and it was hard to find a seat. While more than 7 million people visit Oktoberfest every year, this was hands down the best and quickest service we had in Germany. We ate the 1/2 roasted chicken and apple strudel which was fantastic, not to mention the liters and liters of German beer (Augustine was our favorite)! The next day, we locked up our luggage at the train station as we enjoyed our last day in Munich. We stopped by the park where you can watch surfers. That’s right. 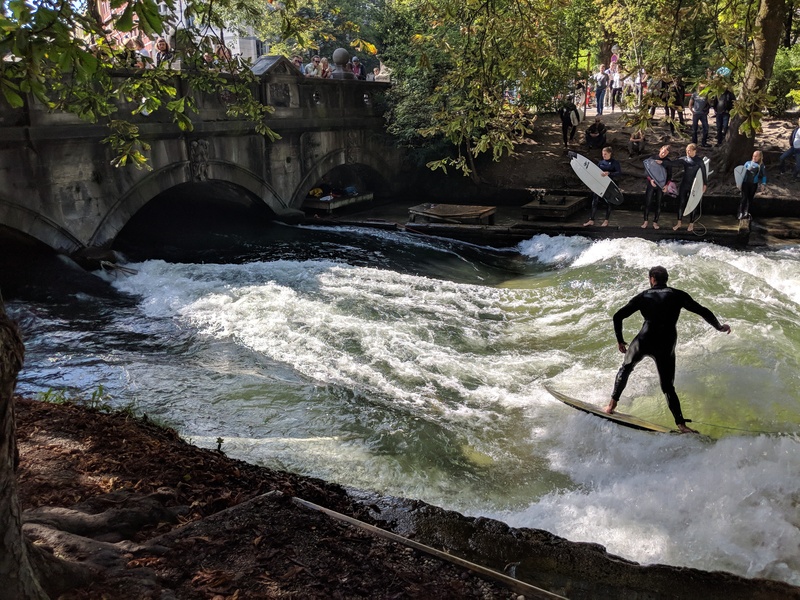 There’s no beaches in Munich, but stop by the Englischer Garten where you can watch people expertly surf on the Eisbach river below the bridge! Then, we took a train and bus to Dachau Concentration Camp Memorial. While the sobering experience is difficult to communicate here, it’s important to see and learn. Maintaining memorials and museums like this will help humankind avoid making the same terrible mistakes in the future. We rode the ICE (high speed train), a long but comfortable ride, from Munich to Berlin. I have family in Berlin that were kind enough to let us stay with them for a couple nights. With one full day in Berlin, it was a whirlwind of walking around the city, taking in the sights, history, people, and of course, stopping by a biergarten. I wish I had more time here to experience the city and really take in the sights. Learning about the history of Berlin and experiencing what it is today had my head spinning with thoughts of what it must have been like. We visited the Topography of Terror (free museum on the former site of the SS Reich Main Security Office) where we read about the rise and fall of Nazi Germany. Additionally, we saw buildings damaged by bullet and bombs during WWII and walked along parts of the Berlin Wall. Our host lived in West Berlin before, during and after the wall came down. It was fascinating to hear her stories at breakfast and then walk along traces of the wall and the East Side Gallery that same afternoon. After a night of rest, we picked up a rental car and headed south for a Bavarian road trip on the autobahn. Our first stop was Rothenberg, a charming town that looks right out of a fairy tale. We walked along the ancient wall and towers that protected the town during medieval times. It almost didn’t seem real, like I was in a fabricated village of Disneyland. You’ll see the Disneyland theme return a few times while in Bavaria. We spent a quiet morning walking around the town, admiring the adorable architecture and enjoying cappuccinos and schneeballen (snowballs in English). Schneeballen are a local treat of shortbread and covered with powered sugar, chocolate, coconut and various other combinations! Honestly, I’ve never been a fan of shortbread, and think they look better than they taste. Here’s where the magic of Disney returns, but in real life. We drove to Hohenschwangau and hiked up to see Neuschwanstein castle twice – this is said to be the inspiration for Cinderella’s fictional home. I’ll let you read about the history from a different source. It’s a short, up-hill hike to see a view of the castle, and we kept going past the trail as far as we could until the clouds and rain rolled in an we could no longer see beyond the trees. The next morning, we hiked up in the dark to watch the sunrise over the castle. There were only a couple others out there, so I highly recommend going at this time to beat the crowd and take in the magical views. After watching the sunrise, we strolled over to Alpsee lake where I became fascinated with photographing the reflective water and its feathered inhabitants. We stayed at the Hotel Muller where we had a lovely suite with views of the castle. I also enjoyed a wine tasting here – I believe it was 30 something Euros for the basic tasting of 4-5 wines. If the Neuschwanstein was Cinderella’s Castle, then Hoellentalklamm (Hell Valley Gorge) was Splash Mountain. For a small entrance fee, you can hike through this beautiful gorge, ducking through tunnels in the rock, watching your step over slippery surfaces and getting totally wet! The gorge-ous (get it?) hike was all worth it to be so close to nature. The trail ends at a hostel with views of the Alps. We were starving after a full day of hiking and made our way to Gasthof Fraundorfer for Bavarian cuisine and what ended up to be our favorite beer of the trip, Konig Ludwig Weiss. View of the Eagle’s Nest from about 1/2 through our hike. See what I mean by a long, uphill walk? One of our last adventures in Germany was the hike to The Eagle’s Nest, Hitler’s mountain retreat which still stands on a peak in the Bavarian Alps. It is now a restaurant, and a tourist destination to take in beautiful views of the mountains. Weather was not great when we went, so I’m afraid I missed out on the view. However, I did not miss out on some exercise. There is a bus that will take you a majority of the way up the hill, and then an elevator that a bus ticket will get you a ride on. We skipped the bus and made the hike from the parking lot. It was a steep, uphill walk, but the path was paved and well maintained. If you like walking/hiking, I would recommend this to really take in the experience (and get it for free!). Just don’t be like me, as I wasn’t expecting a 4 hour hike like this and did not pack any water or snacks. I really enjoyed my time in Germany, and was surprised by all the hiking and views we squeezed in. It was also a great lesson in history regarding the Holocaust, WWII and Cold War. I would come back for a few days at Oktoberfest for sure! I wish I had more time in the Alps, too, so I suppose I’ll have to return another time. We moved through town to town pretty quickly when I wish I could have slowed down a bit to explore deeper. I didn’t even mention the time we drove over the border to get coffee in Austria or stopped to visit Dirk Nowitzki’s hometown! The only downside was that this wasn’t a foodie destination for me, as I got tired of Bavarian food pretty quickly. Have you ever been to Germany? What sights would you recommenced? Let me know in the comments! Ocho Rios is in the parish of Saint Ann on the northern coast of Jamaica. We chose it because it was more affordable than Montego Bay, but still had plenty of what we wanted to do. And honestly, all I wanted to do was sit on the beach in the sunshine with a tropical drink! Ocho Rios has several different resorts and tourists activities and is famous for being featured in the very first James Bond movie. We flew into Montego Bay (Sangster International Airport) and our resort included airport pick up and drop off which was AWESOME! There was a traffic jam and the bus stopped at other resorts first, so we were on the bus for several hours. Not as fun, but still worth the trouble and cost savings. Coffee bar – not the best but definitely took advantage of it! You know how I said this was a relaxing trip? Well that still doesn’t mean I’m going to do nothing! While lots of lounging at the pool and beach happened, I also took the opportunity to get off of the resort! As I mentioned above, the resort has a dive shop on site which made planning our dive super easy and affordable! We went to the dive shop the day before, paid $100 per person for a two tank dive and met the dive master the next morning. We took a boat from the resort out to the water. We dove around the reefs and saw some fish and rays – first dive was down to 60 feet and the second was to 30 feet. Nothing spectacular, but it was nice to get a dive in! Delton (aka Dr. Fun) will basically take you on a custom tour based on what you want to do! We wanted to see the famous Blue Mountain coffee of Jamaica. So he picked us up from our resort and the road trip to Blue Mountain began! It was a great time and the highlight of the trip. It was a long ride to Blue Mountain, but Dr. Fun made it FUN! Delton talked almost the entire ride telling us about Jamaica and the area, plus we added some extra stops! We learned about and tasted the local fruit from a fruit stand and straight from the trees (Jamaica Apples which are kinda like pears and only grow two places in the world, Coconuts, Sugar Cane and more). Stopping at a local fruit stand to drink coconut water and try coconut jelly (flesh of young coconut) for the first time! We visited the James Dennis Coffee Farm where we learned about the coffee process from start to finish. We then tasted fresh, fire roasted coffee and enjoyed an authentic Jamaican lunch. You can buy a pound of beans for $30 – much less than you’ll find at the airport! The coffee was very unique and fresh tasting. As someone obsessed with coffee, I loved being able to try this. Drinking coffee freshly roasted and brewed all on a wood fire. Lunch of chicken, boiled yam, boiled green banana and dumpling. Coffee Cherries growing on Blue Mountain. We learned that the land in Jamaica is very fertile and can grow almost anything! These falls are famous in Jamaica and they basically made a water park out of it. After entering the park, you’ll be grouped together and hike up the falls. You’ll be asked to leave your hat, sunglasses, etc. behind so you don’t lose them! Groups were holding hands to help each other up, but we opted not to do that as we were very comfortable with hiking (wear good water shoes!). It was pretty crowded but we still had a good time climbing up the falls and getting in the water. I wouldn’t go again (I’m glad I did it once, though! ), but if I were to, I’d try to go much earlier to beat the crowd! The Pacific Northwest United States is one of my favorite summertime destinations (after Colorado). I recently spent a long weekend in the Portland, Oregon area and want to share some highlights! That’s my mom in orange. We found a great spot to eat lunch by the water! According to AllTrails, Opal Creek Trail is 6.4 miles out and back and rated easy. Take a relaxing hike through lush forest trails, explore an abandoned saw mill and stop for lunch or take a dip in emerald colored pools. This was a fun and easy hike. After about 4 miles, we veered down to the creek for a relaxing lunch near some falls. I couldn’t believe the color of the water! We arrived to the trail parking lot around noon on a Friday. There was plenty of parking lot and the trail was not crowded at all. So, Tiki Bars aren’t really a thing in Dallas (where I live now), but they totally are in Portland. I’m not mad about it. We had dinner and drinks at Hale Pele and it did not disappoint! They have an overwhelming cocktail list with more than 50 exotic choices. Honestly, I don’t even recall what I ordered but I don’t think you can go wrong. We ordered an array of small plates for dinner – I loved the wings, tacos and Hawaiian bread! The atmosphere is fun and intimate – I won’t give away all the surprises though! Weird = awesome. And Rimsky-Korsakoffee House is totally that. They only serve coffee and dessert (not even booze) and don’t open until 7 p.m. It’s intimate, weird and fun with delicious coffee. We came on a Saturday night and there was live music which was nice! I had a cappuccino with hemp milk. If you’re in Portland – go here for your after dinner drinks! I had a blast at EaT: An Oyster Bar – not to mention delicious fresh oysters, fried oysters and maybe a couple oyster shooters! Whenever I’m in a region with fresh seafood, I love to indulge. This is the perfect place for that and in an adorable neighborhood in Portland. I spent the morning and afternoon exploring 23rd street with my mom and had so much fun! I started the day off with a cortado from Barista and some treats from Blue Star Donuts. The injectable creme brulee donut was fun, and I LOVED the lavender and pear fritter. Yum! Then we shopped around the numerous boutiques – I really liked 3 Monkeys, Ipnosi and Hip Hound. Hip Hound is a pet store that also has a coffee bar called Java Hound, how cool is that? They have a great selection of flavored lattes with house-made syrups and will add CBD oil to any drink. Probably the most Portland thing ever. If you bring your pup and get a drink, he/she gets a free puppaccino! We took a break between shopping with brunch at The Fireside. They had a cool atmosphere, great menu, tasty food. It was a little overpriced in my opinion, but hey, I’m on vacation. That was my whirlwind of a trip in Portland. I’ll definitely be back, so let me know what you recommend for next time in the comments below! Enter your email address to follow Road and Air and receive new posts by email. © Road and Air, 2014. Unauthorized use and/or duplication of this material without express and written permission from this blog’s author and/or owner is strictly prohibited. Excerpts and links may be used, provided that full and clear credit is given to Road and Air with appropriate and specific direction to the original content.